The PartyBot is a Limited Edition Physical type weapon. Don't be fooled by this edition of the DeathBot. Although it likes to dress up and party, it still poses a great threat to mousekind. The PartyBot is a Limited Edition weapon and can no longer be acquired by Hunters. It was not sold by any Trapsmith. It can only be crafted given the proper ingredients. The required Party Hat was obtainable from Birthday Gifts and the General Store in Ronza's Traveling Shoppe during her MouseHunt's Birthday Giveaway visit. Mouse DeathBot – Source of DeathBot Parts required to craft the PartyBot. 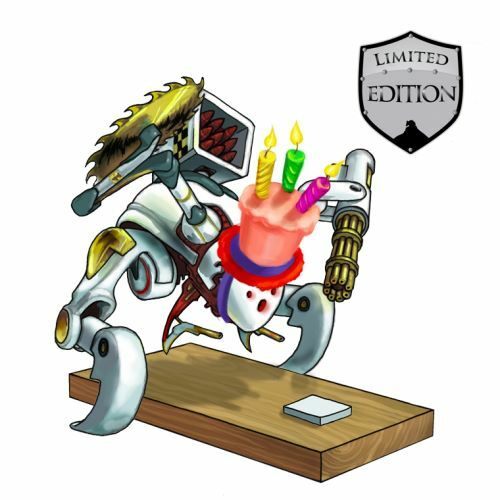 7 March 2009: The PartyBot was introduced when hunters were finally able to open their Birthday Gifts and discovered the Party Hat inside. The formula to craft the PartyBot was found in the Party Hat's description. 19 October 2009: The PartyBot received the Limited Edition shield.